I really need to start more science instruction in my homeschool. Right now we mainly do science by reading books. I am a certified teacher and have 4 kids ages 8 to 1 1/2 and am teaching my 8, 6, and 4 year old during our "school time". I blog at chickenbabies.blogspot.com. I currently homeschool two boys ages 12 & 14. They enjoy hands on science and we have been lacking in this area this year. We would love to review this product along with blogging about. Our current science curriculum is drab! 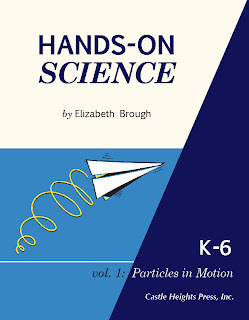 I have one 7 yr old who is reading at a 4th grade level and loves Science. Unfortunately, his current curriculum does not provide any hands on experimenting and is severly lacking in material. I would love the chance to review this book. We are in the process of trying to find something more fun and challenging at the moment already. Amanda, do you have a blog? These all sound like good candidates! I’m still getting the word out and will let you know soon who I will choose to review the book! Thanks ladies! I am interested… I have 6 kids. 4 are homeschooling (ages 5, 8, 10, 12). Busy lady! Thanks for volunteering! I’d like the chance to check out this curriculum. I’m homeschooling a kindergartener.We aren’t currently following a science curriculum per se, just studying things sort of randomly as they come up. I like the idea of something more systematic, but still fun and age appropriate. I could commit to doing several of the activities, as per the requirements stated above. I blog at Cheerios Underfoot: http://www.cheeriosunderfoot.blogspot.com. I actually think I might have missed out on this, but I am going to try! I homeschool an upcoming High School Senior, an upcoming 5th grader, upcoming 3rd grader, 2 upcoming 1st graders and an upcoming k5….. We have an active but productive group. I have been looking for a multi-level hands on science curriculum and I am interested in this program. Let me know if you need a tester! Yes Karen, good try, but no longer offering review copies, I may post the book electronically in the future for sale. We’ll be using portions in our own homeschool!